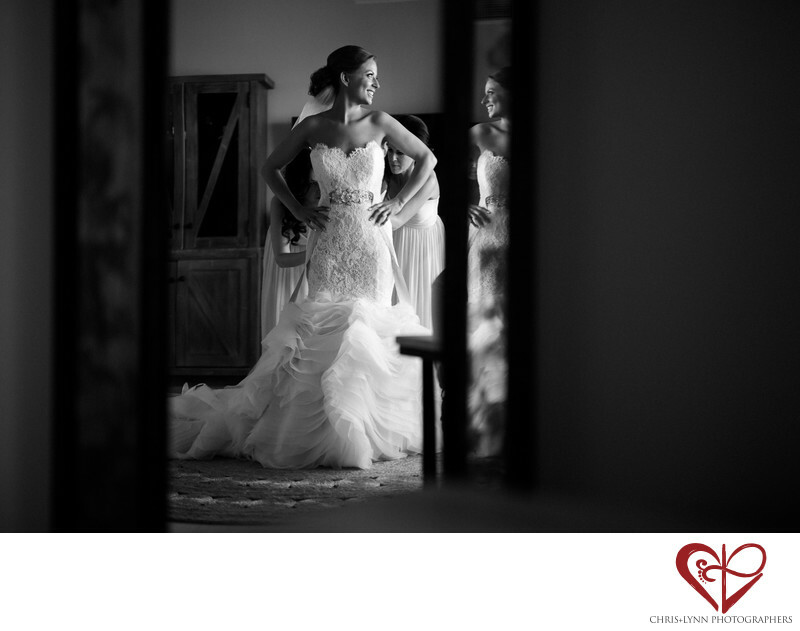 There is always such a feeling of anticipation and excitement during the pre-ceremony wedding photos. The ritual of the bride getting ready - her hair and makeup, wedding lingerie, jewelry and of course putting on the dress - is filled with lovely moments. I love the natural window lighting in this image, simple but dramatic. I love the intricate detail of her Lazaro wedding gown. I love the concentration in the bridesmaid's face as she checks the fastenings of the gown. But mostly I love the bride's genuine smile in this image, reflected in the mirror, as she thinks about seeing her groom for the first time. Esperanza Resort is known as one of Mexico's top luxury wedding venues, and we have been fortunate to have photographed dozens of weddings there. As wedding photographers in Cabo, we love Esperanza Resort for several reasons: 1) Its nouveau Mexican design incorporating an off-white color palette with natural elements such as palo d'arco shade covers and palm frond palapas. 2) Its two private beaches buttressed by the rugged & rocky cliffs on one side and the Sea of Cortes on the other. 3) Its numerous ceremony & reception locations ranging from the poolside date palm grove, to the sandy beach to the cascading clifftop restaurant terraces. 1/1250; f/1.4; ISO 800; 50.0 mm.